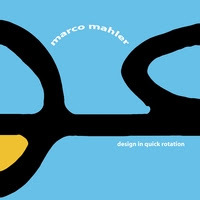 Marco Mahler’s vocals may lean more towards a conspiratorial whisper than a shouted ‘hey-look-at-me’, but it’s his music that rises above that charismatic whisper to snag your ear. Acoustic guitar lines cut through all else, crisscrossing, blooming, like kaleidoscopic patterns in tracks like the instrumental “Hike The Lake”. And yet it’s that very voice, that calming, quiet voice delivering Mahler’s abstract lyrics, that’s the perfect foil to the penetrating acoustic guitar. Although all this isn’t in sacrifice to melody, he does wield a number of strong melodies that will lodge like an arrow in your heart. “Orange Chinese Car” softly thumps like a basketball about to be taken hard to the hoop, while “Study Airports” is an anti-lullaby, a song to wake up to rather than deliver the lulling. Design in Quick Rotation is a surprisingly well-crafted debut from a man who, not surprisingly, is also a sculptor. Visit his myspace page for links to buy. oh yes. this album is great, I'm glad you covered it!